This is an article from ABC news, and though I don’t agree with calling Pro-White civil rights groups “hate” groups, I do see that White people are awaking everywhere. Stop calling us hate groups ABC! Heritage is not Hate, Pride is not Prejudice! 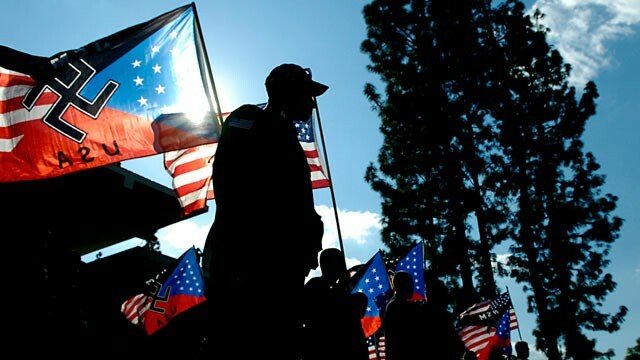 The number of radical hate groups and militias has exploded in recent years in reaction to the changing makeup of America, and new census figures showing the majority of babies born in 2011 were non-white could fuel those simmering tensions, experts who track hate groups warned. The data released this week revealed a tipping point in the country’s demographic shift. For the first time in the country’s history, more minority children were born than white children, setting the stage for an eventual non-white majority in America’s population. The census found that 50.4 percent of births in 2011 were of Hispanic, black, Asian, and other minority children. White babies accounted for 49.5 percent of the country’s newborns. In addition, more than 49 percent of all children under 5 years old are minorities, the report said. For white supremacist and radical right-wing groups, the data is especially troubling, and made all the more apparent by the fact that a black man was elected president, Potok said. “This very real and very significant change is represented in the person of Barack Obama. We’ve of course seen the most remarkable growth in the radical right since 2008, precisely coinciding with Obama’s first three years as president,” he said. According to the SPLC, the number of radical “anti-government” militia groups increased from 150 to 1,274 during the years of the Obama presidency. There have been more homegrown domestic terrorism attacks by right-wing groups than by international terrorists during his presidency as well, Potok noted. Marilyn Mayo, co-director of the Anti-Defamation League’s Center on Extremism, said white supremacist groups have increased their efforts to recruit and plot based on the changing racial makeup of America. “I think that what we’re seeing is that hate groups, particularly white supremacist groups, are talking a lot about the fact that whites will soon be a minority in this country, that their goal at all costs is to preserve the white race in civilization, which spurs them to recruit more, and have more incendiary rhetoric,” Mayo said. Mayo cited two recent plots by radical groups in Florida and Minnesota that involved stockpiling weapons for racially-motivated attacks against other Americans. “These are just examples of people who feel like they are at a point where they have to take action because soon whites will lose power and authority and they have to protect the white race from extinction,” she said. The changes in demographic will challenge the political and social landscape of the country, he said. In California, the shift to a non-white majority in 2000 resulted in changes to the Republican Party, which had to shift left to appeal to non-white voters, he said. Potok pointed out that more young people than ever before, hovering around 95 percent of young voters, approve of interracial relationships and marriage. Though the country is going through a “backlash” against demographic changes, newer generations will come to accept the changes, he said. “The thing I think to understand is that the radical right is not entirely composed of people who are insane. These are people reacting to real changes in the real world around them,” Potok said. This entry was posted on May 18, 2012 at 6:29 pm and is filed under Anti-White Hate Crime and Race Mob News, Illegal Immigration Horde News, White Nationalist Philosophy (Ariosophy and Aryanism), White Politics and Direct Action. You can follow any responses to this entry through the RSS 2.0 feed. You can leave a response, or trackback from your own site.